On Sunday I had the pleasure of watching the match between New Edubiase United FC and Real Tamale United FC. The home side won 1-0 after a penalty goal scored my Stephen Manu after a foul by RTU-defender Seidu Junior Fatau. It was a very poor match and the result meant that RTU will be relegated from the GLO Premier League. Based on the importance of the match, I was surprised to see how few chances RTU managed to create. New Edubiase United FC played with Saliu Iddrisu in goal, usually second choice goalkeeper. The whereabouts of Collins Addo (born 24.04.1989) was unclear. Iddrisu played well but was rarely troubled by the RTU-attackers. Edubiase seemed to play a 3-5-2 formation with a defensive trio consisting of Abeiku Ainooson (born 24.09.1990), Carlos Coffie and Samed Ibrahim. Coffie played a bit to the left and Ibrahim played a bit to the right. It was interesting to see Ibrahim, a former member of the Ghana U-17 national team, and he looked very steady at the back. Ainooson, a tough and hard-tackling central defender, was one of the best performers of the evening. Captain Abubakari Mumuni played in defensive midfield and this consistent player deserves a chance in a bigger club. Baba Gullit (born 23.09.1987) is usually the playmaker of the club and he truly is a creative, tricky player, although I have seen him better before. Hafiz Adam was a new name to me and I believe this is a former player of Tema Youth FC. He worked hard but failed to stand out. Asiedu Attobrah played at the right-side of midfield and I think Attobrah has developed into a very good player. He always seems to be on the run and his work rate is truly impressive. Ebenezer Ofori played at the left-side of the midfield. I had been looking forward to see Ofori as he has received rave reviews lately and he did not disappoint. A very attacking minded winger. However, I must admit that I was a bit disappointed to see one of the other comets at Edubiase this season; Basit Adam. Adam played as a center forward but he never looked dangerous. His partner Stephen Manu (born 21.01.1985) seemed much more intimidating and the big, strong striker scored his first goal in the GLO Premier League 2010-2011 since 24.10.2010. Manu has now scored seven goals this season. Manu was substituted early on due to injury and was replaced by a rather unknown player called Seth Tawiah (born 12.07.1990) who proved to be a lively attacker. Experienced midfielder Abubakar Yahuza (born 08.08.1983) also got some minutes on the field. Real Tamale United FC has a very good goalkeeper in John Adjetey. He kept RTU in the game in the first half and also showed his importance in the second half when he elected himself as the taker of free kicks. Amos Acheampong played at right-back while Joseph Owusu Bempah (born 05.05.1990) played at left-back. I have seen Owusu Bempah impressive before but he had a difficult game on Sunday and seemed uncomfortable on the ball. Acheampong failed to stand out and was rather average. In central defence, strongman Mohammed Yahaya had a wonderful game. I believe this is the same Mohammed Yahaya, born 17.02.1988, that played for French outfit OGC Nice in 2007-2008. Yahaya was partnered by Seidu Junior Fatau who struggled with Manu in the first half but who improved in the second half. Iddrisu Moro played at the left side of the midfield while Richard Yeboah (born 26.09.1984) played at the right. I have seen Yeboah three times this season and I personally think he is one of the shining lights at a rather average team. Yeboah is a tricky and hard-working winger who can play at both flanks. Moro was one of the most exciting players of Ghanaian football in 2009 and featured for both Ghana U-17 and Ghana U-20. The central midfield consisted of experienced captain Toufik Alolo (born 01.10.1982) and Ghana B international Atia Sumaila (born 20.06.1985). Both players are obviously very important players and RTU is in trouble every time they have a bad day. Alolo is a very intelligent and physical player but I think he is a bit slow and he failed to provide the attackers with smart passes on Sunday. Sumaila is usually standing out from the crowd, but he had a very quiet game on Sunday. Sumaila was replaced by Akwasi Soale, an experienced attacker / attacking midfielder, who came into the game at a difficult time. Top scorer Benjamin Boateng (born 03.06.1991), a rather short and lively striker, was paired with the burly Sumaila Nyanya up front. Boateng has been one of the revelations of the second part of the season but never looked dangerous on Sunday. Nyanya has had some impressing matches this season but is not a very consistent player from my point of view. He was not looking sharp on Sunday but to be fair, he did not get a lot of service from the midfield. However, Nyanya had some of the biggest chances of the game but failed to hit the target. Nyanya was replaced by a player called Michael Japaa who is a totally unknown player to me. 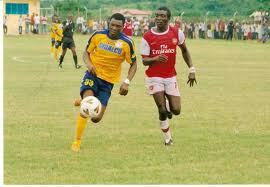 Veteran striker Shilla Alhassan, a very strongful player, also played a couple of minutes. It will be interesting to see which players that will leave RTU after the relegation. I personally think several of their players will become targets for other clubs in Ghana, especially goalkeeper John Adjetey and midfield general Atia Sumaila. Benjamin Boateng is apparently on a loan deal and will probably go back to Hearts of Oak SC. The picture, taken from ghanasoccernet.com, is of the only scorer of the match, Stephen Manu of New Edubiase United FC. Manu is the player in the yellow shirt.